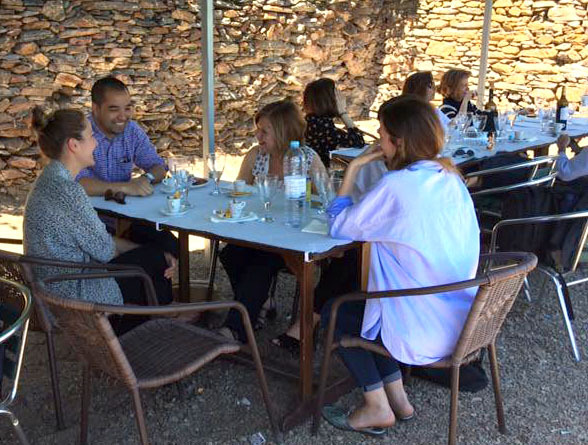 High up in the hill town of Monsaraz, looking out over Lake Alqueva we ate our way through a lunch of traditional Alentejo flavours. My mom was visiting us in Portugal, from Toronto, and Susete and I had arranged with our local friends, Mafalda and Diana Dançante to take both our moms out for a nice Mother’s Day lunch (earlier in Portugal, than Canada). 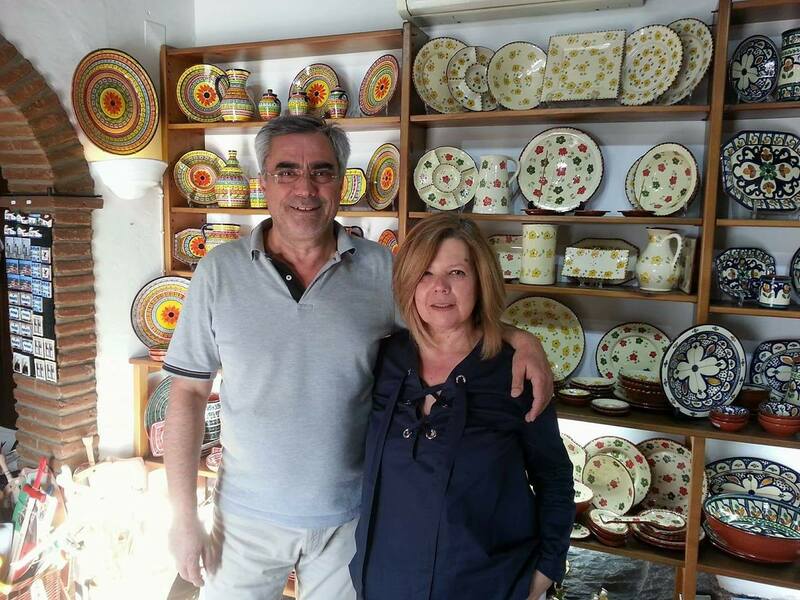 I wanted to take my mom out to the countryside so she could experience a different side of Portugal than city life, so we decided to meet in the town where the Dançantes have their pottery store, XarazArte. This was supposed to be a nice Mother’s Day treat, but at the end of lunch, Gina (the Dançante mom) had conspired with the staff at Sabores Monsaraz to gang up on me and block me from paying, instead taking care of the bill herself. There’s nothing like old Portuguese ladies yelling at me and then laughing at my inability to fight back in their language. You simply can’t argue with them. Walking up the hill in through the fortified town walls to XarazArte… I couldn’t help but notice the Dançante ladies walking with their high heeled shoes on these medieval cobble-stoned roads. “How the hell do they do that?” I asked Susete. “I dunno how they do that… I guess they’re just used to it,” she responded. Amilcar (the Dançante father) was waiting to greet us in the store, as he was left out of the family lunch…. someone had to run the store! This experience is how I sum up the Dançante family. A family that is a unique contradiction (or combination?) of tradition and modernity. It’s funny, because when we were making the plans to meet up, trying to figure out where to take our mothers for lunch, I had jokingly asked Mafalda if they had any enemies in town, because we’d avoid that restaurant. Her reply to me was pretty simple, “No, we don’t have enemies, we’re way too nice… everyone loves us!” No statement could be more true than that one. They really are that nice. Coming from an ultra-competitive city like Toronto, at times it’s almost uncomfortable how nice and generous they are, but then as I spent more time in Portugal I have come to realize that they are really just a classic example of old school Portuguese culture. 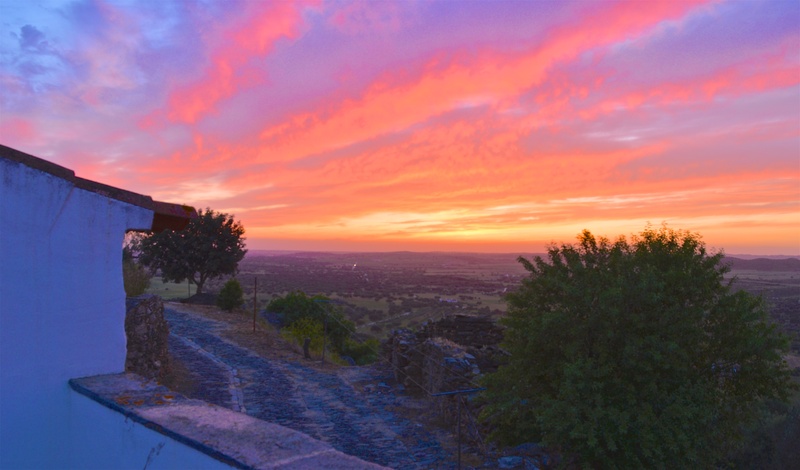 The hospitality level in this country is unsurpassed by anywhere else, and the Alentejo region completely epitomizes this characteristic. However, this isn’t an article about Portuguese history or culture… you’ll get enough of that from me in other articles. We’ve known the Dançante family for a few years now and out of everything I’ve written about Portugal, I have yet to write about them, so this is my tribute to a family that is not only our friends, but also are producers of one of our favourite traditional Portuguese products. I first met the Dançante family a few years ago, on my second trip to Portugal. My friend and kitchen co-worker Prince Phil came with me to explore the Alentejo region of Portugal in our quest to learn as much as possible about Portuguese cuisine. Alentejo is known as the agricultural heartland of the country, which is evident in the food of the region. 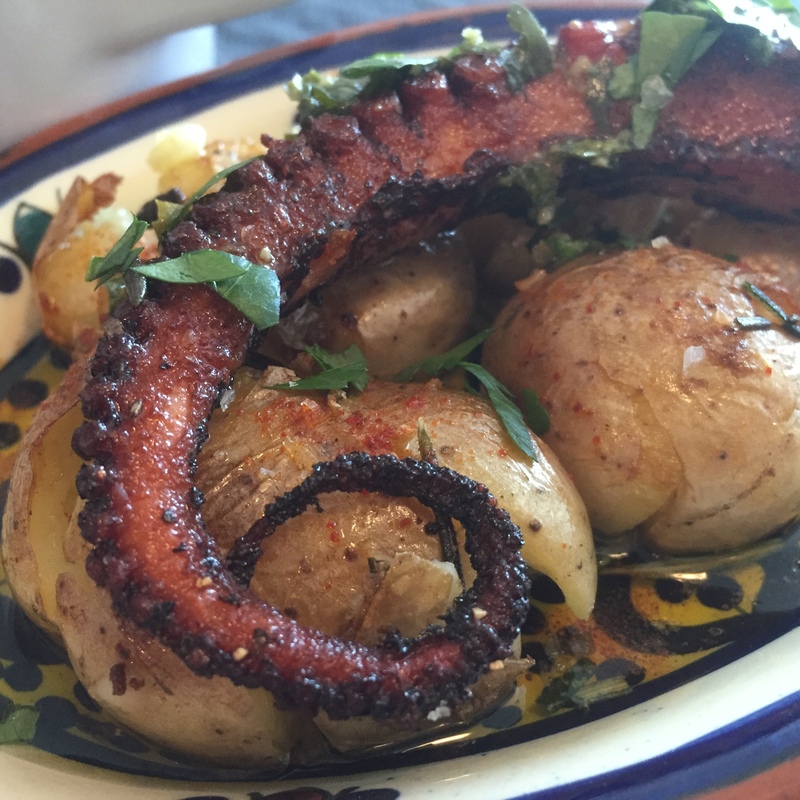 It’s Portugal’s soul food, and one my favourite regional cuisines. 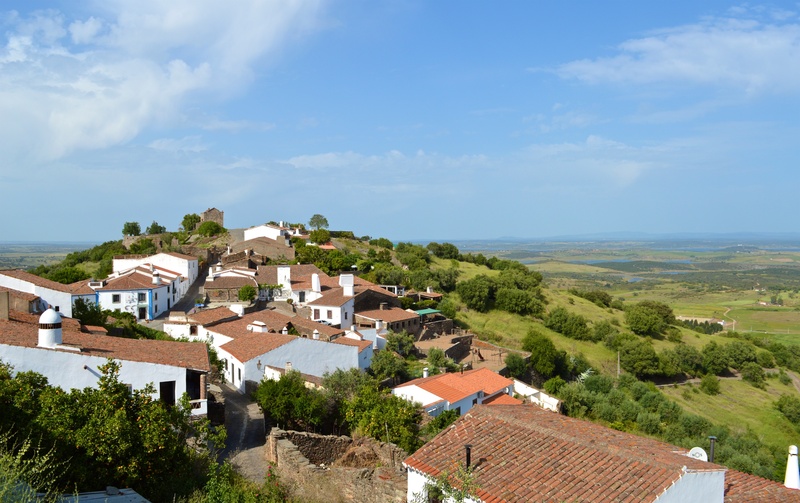 In looking for accommodations in the small, traditional hill town of Monsaraz, close to the Spanish border, I had communicated with Diana on their rental property, and on arrival, had met Gina who had greeted us for our stay. 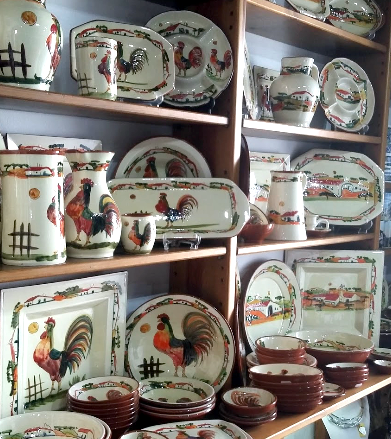 On that trip, I had brought back a small collection of Gina’s dishes from, and from then on, Susete and I were officially life-long fans of their traditional Alentejo handiwork. Amilcar and Gina had both moved to Lisbon at a young age, having both been born in the Alentejo region. They met, married, and had two daughters, Mafalda and Diana. With a creative spirit, Gina had taken on the hobby of creating ceramics that was traditional to her home region. As the years went on, Amilcar and Gina grew weary of city life in Lisbon and decided it would be best to raise their daughters in a more peaceful setting close to their hometowns, so they relocated about 3 hours inland (2.5 hours if you drive like the Portuguese do) to the small hamlet of São Pedro de Corval, close to Monsaraz and Portugal’s border with Spain. This area is steeped in history, and influence from overlapping cultures over the centuries. The Romans had a strong tradition of pottery used to hold wine and olive oil… both staple products in this region, and the art of ceramics was certainly further influenced by the presence of the Moorish Kingdoms, with their geometric patterns most associated with the traditional Portuguese azulejos (tiles). 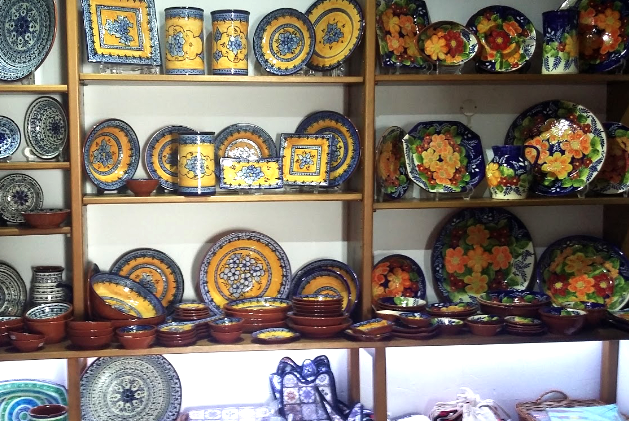 With traditional pottery being found all over Portugal, Corval can be said to be the centre of this art form, as it has the most pottery workshops (olarias) in the country. 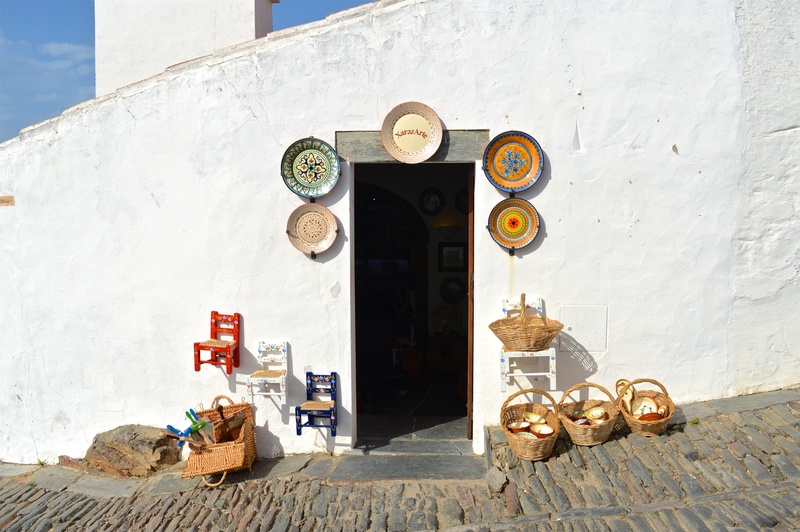 After having opened their workshop in Corval, the Dançantes then opened a store to sell their products up on the hill in Monsaraz, within the castle walls. 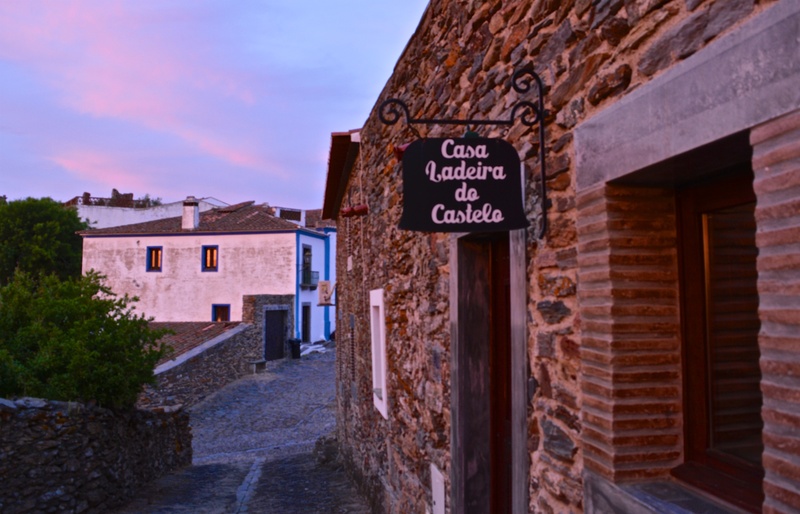 This medieval town now has few permanent residents, but is a popular visiting point due its beauty, charm, and sweeping views over the Alentejo landscape, overlooking Lake Alqueva. XarazArts is everything you’d want in a pottery store. It’s cute, it’s quaint, it’s covered wall-to-wall with various ceramic pieces, and has owners that are customer focused and will have you chatting for hours if you let them. We often joke with the girls that we don’t need to ask them any questions because their mom has already told us everything about their lives, as well as their entire futures! Visiting XarazArte, you’ll have a similar experience to mine… the hardest part is trying to narrow down what to buy, as there are just too many things to choose from! Each visit I make to this shop is the same as the previous one. I just want to take all of it home. Dishes, bowls, mugs, jugs, etc. Different creative themes, colours and patterns. As they are hand-painted, each piece is unique. Even when you think you’re getting two of the same pattern, when you look closer you can see the subtle differences that make them all one-of-a-kind. Gina and Amilcar have expanded their business extensively. 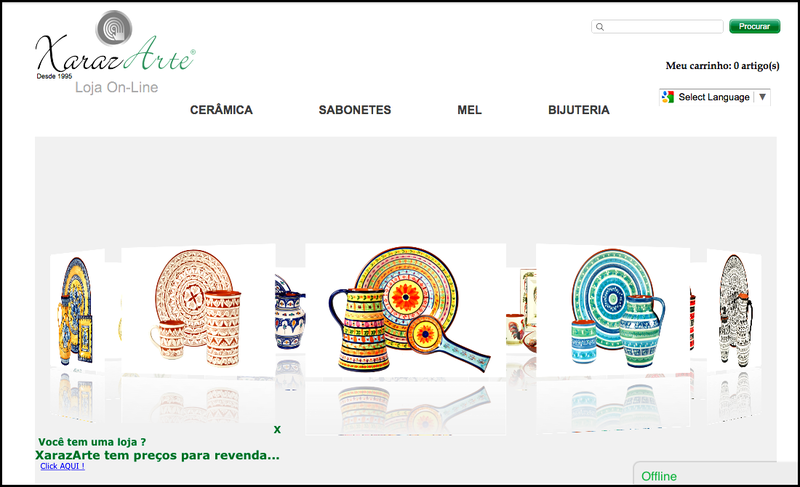 Both in Lisbon and in Porto (Portugal’s largest cities) I’ve found several stores that feature XarazArte ceramics. Gina told me that they also ship all over Europe. Business has gotten so good that they are (sadly for me) going to give up their rental property in Monsaraz, for lack of time, and are now working on renovating and expanding the Olaria in Corval. Amilcar proudly showed me the work he’s been doing on the new website to expand their online ordering business. With Gina and Amilcar growing XarazArte exponentially, and both their daughters completing their Masters degrees – Mafalda in Virological science and Diana in Tourism & Marketing, this ambitious family is destined for a successful future, differentiating themselves from many in this ultra-traditional region, which often seems like it’s a region that time has forgotten (actually one of Alentejo’s many charms). On our last weekend in Lisbon, Susete and I had Mafalda and Diana over for dinner at our apartment in the São Bento neighbourhood. We laid out a feast of a meal, and the girls thought even this was too much, but it’s the only way I could think to even begin to repay this family. I’ve learned this is the spirit of Alentejo. An open heart and an endless supply of generosity. They want nothing in return, but for the people they encounter to leave with smiles on their faces. The Dançante family – Amilcar, Gina, Mafalda & Diana, perfectly encapsulate this traditional trait of hospitality, while allowing their creativeness, curiosity and ambition fuse a modernity into their personas. Fashion-forward with old-school values. This is my observation of Portugal as a country at the moment… past and future perfectly intertwining together, with no need for one to overtake the other. 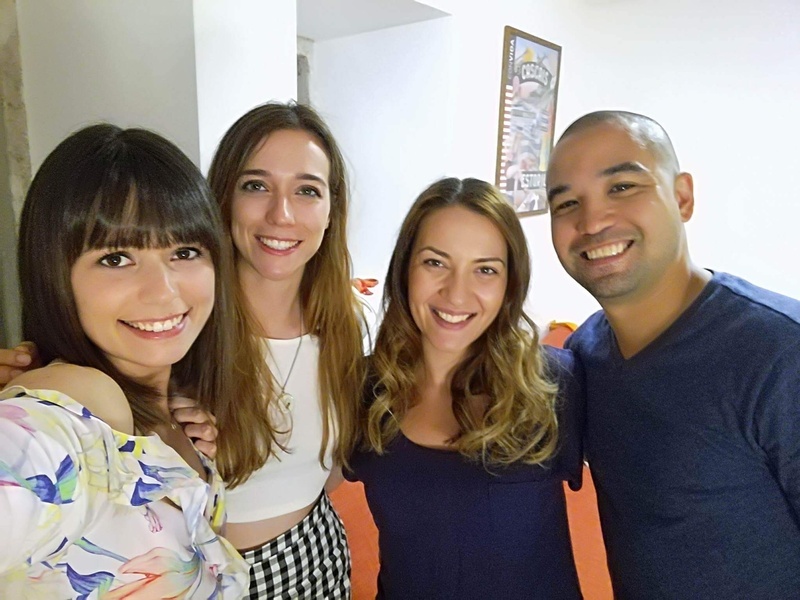 I’ve often said that the people you meet traveling are what create the experiences that you have, and for anyone visiting Portugal, you can be sure to meet many families like this one, that truly capture the Portuguese spirit that no guidebook will ever be able to tell you about. This is how you really experience Portugal. PORTUGUESE TRANSLATION FOR MY PORTUGUESE FRIENDS! “Eu amo muito o estilo deles!” Susete me proclamou, quando nos sentamos para almoçar com nossos amigos do Alentejo. “Não é o que você esperaria aqui no campo, eles se vestem tão bem … eles parecem mais com Lisboetas”. No alto da cidade montanhosa de Monsaraz, olhando para o lago Alqueva, fomos o nosso caminho através de um almoço de sabores tradicionais do Alentejo. Minha mãe estava nos visitando em Portugal, de Toronto, e Susete e eu organizamos com nossos amigos locais, Mafalda e Diana Dançante, para levar as duas mamães para um bom almoço no Dia das Mães (mais cedo em Portugal e Canadá). Eu queria levar minha mãe para o campo para que ela pudesse experimentar um lado diferente de Portugal do que a vida da cidade, então decidimos nos encontrar na cidade onde os Dançantes têm sua loja de cerâmica, XarazArte. Era suposto ser um bom dia de festa da Mãe, mas no final do almoço, Gina (a mãe de Dançante) havia conspirado com a equipe de Sabores Monsaraz para se unirem e me impedir de pagar, em vez de cuidar da conta própria . Não há nada como velhas senhoras portuguesas gritando comigo e depois rindo da minha incapacidade de lutar em sua língua. Você simplesmente não pode discutir com eles. Subindo a colina pelas muralhas da cidade fortificada para XarazArte … Não pude deixar de notar as senhoras Dançante andando com seus sapatos de salto alto nessas estradas medievais. “Como diabos eles fazem isso?”, Perguntei a Susete. “Não sei como eles fazem isso … acho que eles estão acostumados a isso”, ela respondeu. Amilcar (o pai Dançante) estava esperando para cumprimentar-nos na loja, como ele foi deixado para fora do almoço da família …. Alguém teve que executar a loja! Esta experiência é como eu sinto a família Dançante. Uma família que é uma contradição única (ou combinação?) De tradição e modernidade. É divertido, porque quando estávamos fazendo os planos para se encontrar, tentando descobrir onde levar nossas mães para o almoço, perguntei com brincadeira a Mafalda se tivessem inimigos na cidade porque evitaríamos esse restaurante. Sua resposta foi bastante simples: “Não, não temos inimigos, somos muito agradáveis … todos nos amam!” Nenhuma afirmação poderia ser mais verdadeira do que essa. Eles realmente são tão bons. Vindo de uma cidade ultra competitiva como Toronto, às vezes é quase desconfortável o quanto eles são gentis e generosos, mas então, enquanto passava mais tempo em Portugal, percebi que eles realmente são apenas um exemplo clássico da cultura portuguesa da velha escola. O nível de hospitalidade neste país é insuperável em qualquer outro lugar, e a região alentejana simboliza completamente essa característica. No entanto, este não é um artigo sobre a história ou a cultura portuguesa … você terá bastante disso em outros artigos. Já conhecemos a família Dançante por alguns anos e de tudo o que escrevi sobre Portugal, ainda não escrevi sobre eles, então este é o meu tributo a uma família que não é apenas nossos amigos, mas também são produtores De um dos nossos produtos tradicionais portugueses favoritos. Conheci a família Dançante alguns anos atrás, na minha segunda viagem a Portugal. O meu colega amigo e coletivo Prince Phil veio comigo para explorar a região alentejana de Portugal na nossa missão de aprender o máximo possível sobre a gastronomia portuguesa. O alentejo é conhecido como o pátio agrícola do país, o que é evidente nos alimentos da região. É a comida da alma de Portugal, e uma das minhas cozinhas regionais favoritas. Ao procurar acomodações na pequena e tradicional cidade montanhosa de Monsaraz, perto da fronteira espanhola, eu tinha me comunicado com a Diana em suas propriedades de aluguel e, à chegada, conheci Gina que nos cumprimentou para a nossa estadia. Naquela viagem, trouxe de volta uma pequena coleção de pratos de Gina, e a partir de então, Susete e eu fomos fãs oficialmente de toda a vida de sua obra tradicional alentejana. Amilcar e Gina se mudaram para Lisboa em uma idade jovem, tendo ambos nascido na região do Alentejo. Eles se encontraram, se casaram e tiveram duas filhas, Mafalda e Diana. Com um espírito criativo, Gina assumiu o hobby de criar cerâmica que era tradicional em sua região natal. Com o passar dos anos, Amilcar e Gina ficaram cansados ​​da vida da cidade em Lisboa e decidiram que seria melhor criar suas filhas em um ambiente mais tranquilo perto de suas cidades, então eles se mudaram para cerca de 3 horas no interior (2,5 horas, se você dirigir como O português) para a pequena aldeia de São Pedro de Corval, perto de Monsaraz e a fronteira de Portugal com a Espanha. Esta área é mergulhada na história e influência de culturas sobrepostas ao longo dos séculos. Os romanos tinham uma forte tradição de cerâmica usada para armazenar vinho e azeite … ambos os produtos básicos nesta região, e a arte da cerâmica certamente foi influenciada pela presença dos reinos mouros, com seus padrões geométricos mais associados ao tradicional português Azulejos (azulejos). Com a cerâmica tradicional encontrada em todo Portugal, Corval pode ser dito ser o centro desta forma de arte, pois tem a maioria das oficinas de cerâmica (olarias) no país. Depois de ter aberto sua oficina em Corval, os Dançantes abriram uma loja para vender seus produtos na colina de Monsaraz, dentro das muralhas do castelo. Esta cidade medieval tem poucos residentes permanentes, mas é um ponto de visita popular devido à sua beleza, charme e vistas deslumbrantes sobre a paisagem alentejana, com vista para o lago Alqueva. XarazArts é tudo o que você quer em uma loja de cerâmica. É fofo, é pitoresco, é coberto de parede a parede com vários pedaços de cerâmica e tem proprietários focados no cliente e você conversará por horas se você os deixar. Muitas vezes, gracejamos com as meninas, não precisamos fazer perguntas porque a mãe já nos contou tudo sobre suas vidas, bem como sobre todo o seu futuro! Visitando o XarazArte, você terá uma experiência similar à minha … a parte mais difícil é tentar restringir o que comprar, pois há apenas muitas coisas para escolher! Cada visita que faço nesta loja é a mesma que a anterior. Eu só quero levar tudo para casa. Pratos, tigelas, canecas, jarros, etc. Diferentes temas criativos, cores e padrões. Como eles são pintados à mão, cada peça é única. Mesmo quando você acha que está obtendo dois dos mesmos padrões, quando você se aproxima, você pode ver as sutis diferenças que os tornam todos únicos. Gina e Amilcar expandiram seus negócios extensivamente. Tanto em Lisboa quanto no Porto (as maiores cidades de Portugal) encontrei várias lojas que apresentam cerâmica XarazArte. Gina me disse que eles também enviaram por toda a Europa. O negócio ficou tão bom que eles (tristemente por mim) vão desistir de seus imóveis de locação em Monsaraz, por falta de tempo, e agora estão trabalhando em renovar e expandir o Olaria em Corval. Amilcar orgulhosamente me mostrou o trabalho que ele tem feito no novo site para expandir seus negócios de pedidos on-line. Com Gina e Amilcar crescendo XarazArte de forma exponencial, e ambas as filhas que completaram seus mestrados – Mafalda em Ciências Virológicas e Diana em Turismo e Marketing, esta ambiciosa família está destinada a um futuro bem sucedido, diferenciando-se de muitos nesta região ultra tradicional, que Muitas vezes parece que é uma região que o tempo esqueceu (na verdade, um dos muitos encantos do Alentejo). Em nosso último fim de semana em Lisboa, Susete e eu tínhamos Mafalda e Diana para jantar no nosso apartamento no bairro de São Bento. Nós apresentamos uma festa de uma refeição, e as meninas achavam que isso era demais, mas é a única maneira que eu pensava mesmo para começar a pagar essa família. Aprendi que este é o espírito do Alentejo. Um coração aberto e um fornecimento infinito de generosidade. Eles não querem nada em troca, mas para as pessoas que encontram para sair com sorrisos em seus rostos. A família Dançante – Amilcar, Gina, Mafalda & Diana, encapsula perfeitamente esse traço tradicional de hospitalidade, permitindo que sua criatividade, curiosidade e ambição fundam uma modernidade em seus personagens. Fashion-forward com valores da velha escola. Esta é a minha observação de Portugal como um país no momento … passado e futuro interligando-se perfeitamente, sem necessidade de ultrapassar o outro. Muitas vezes eu disse que as pessoas que você conhece viajar são o que criam as experiências que você tem e para quem visita Portugal, você pode ter certeza de conhecer muitas famílias como essa, que realmente capturam o espírito português de que nenhum guia será Capaz de falar sobre você. É assim que você realmente experimenta Portugal. Truly a beautiful family in every way. Their generosity was overwhelming and their pottery was incredibly beautiful, it was all I could do to select just a few of these beauties! Can’t wait for another trip back one day.